Soil structure plays an important role in understanding soil attributes as well as hydrological processes. Effective method to obtain high quality soil map is therefore important for both soil science research and soil work ability improvement. However, traditional method such as digging soil pits is destructive and time-consuming. 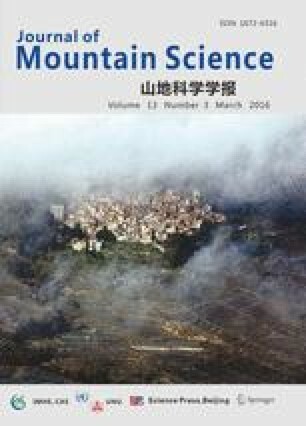 In this study, the structure of headwater hillslopes from Hemuqiao catchment (Taihu Basin, China) have been analyzed both by indirect (ground penetrating radar, GPR) and direct (excavation or soil auger) methods. Four transects at different locations of hillslopes in the catchment were selected for GPR survey. Three of them (#1, #2, and #3) were excavated to obtain full-scale soil information for interpreting radar images. We found that the most distinct boundary that can be detected by GPR is the boundary between soil and underlain bedrock. In some cases (e.g., 8–17m in transect #2), in which the in situ soil was scarcely affected by colluvial process, different soil layers can be identified. This identification process utilized the sensitive of GPR to capture abrupt changes of soil characteristics in layer boundaries, e.g., surface organic layer (layer #1) and bamboo roots layer (layer #2, contain stone fragments), illuvial deposits layer (layer #3) and regolith layer (layer #4). However, in areas where stone fragments were irregularly distributed in the soil profile (highly affected by colluvial and/or fluvial process), it was possible to distinguish which part contains more stone fragments in soil profile on the basis of reflection density (transect #3). Transect #4 (unexcavated) was used to justify the GPR method for soil survey based on experiences from former transects. After that, O horizon thickness was compared by a hand auger. This work has demonstrated that GPR images can be of a potential data source for hydrological predictions.